New study says people who work overnight jobs have a greater risk for health concerns. Night shift employees have been linked to higher rates of heart attacks, diabetes, disrupted menstrual cycles, high blood pressure and cancer. Now a new study says these evening jobs are responsible for disrupting our genetic makeup. Out of approximately four million working shifts the numbers from 2011 suggest that 338,000 of those employees worked during the night only and nearly 559,000 worked swing shifts that were a combination of night and day. These figures were taken from the Labor Force Survey which define night shift as the hours 6:00 p.m. to 6:00 a.m.
Scientists at the University of Surrey’s Sleep Research Center studied 22 people whose sleep cycle was altered by four hours each day until their sleep-wake patterns were 12 hours out of sync with a normal day. The research team then collected blood samples to measure the participants’ rhythms of gene expression. What the researchers found was that a six-fold reduction in the number of genes that displayed a circadian rhythm occurred during the disruption of sleep timing. The circadian rhythm is the internal clock that regulates the body’s daily cycle and allows it to heal itself. Sleep is normally regulated to take place, in humans, during the biological night. During the night is when melatonin is synthesized and body temperature is low. When sleep-wake timing is out of sync, as occurs during jet lag or overnight shifts, a disruption of rhythmicity in endocrinology and physiology is the result. The scientist said this caused “profound disruption” to the 24-hour rhythm of genes. Many of these genes are responsible for the body’s natural abilities to maintain and repair itself. Professor Derk-Jan Dijk said when people are put through these protocols the very basic processes deep down are influenced. This alone could possibly explain why the hours a person works has been implicated in increasing the risk of a myriad of health problems. The researchers estimated about one-third of a person’s genes would ultimately be impacted during sleep disruptions. This is an even higher ratio than a previous study suggested after testing the effects of sleep deprivation on gene activity. Dijk, a senior study author and professor of sleep and physiology, said the study didn’t connect health problems and overnight work directly but said it does give greater understanding to why sleep has such great of a power of influence on a person’s health. Outside of the health risks many have found great benefits by working the night shift. They tend to receive higher compensation, more flexibility for appointments, smoother commute to work, less meetings at the office and usually less upper management to “harass” or micro-manage staff. In the wake of this new study many might find that the cons now outweigh the pros. Genes transmit the directives for making proteins. Researchers said proteins make up just about every type of hormone, chemical signal and tissue in the body. When the timing is off it halts the production that should correspond to our behaviors. According to this new study people who work overnight jobs or experience constant jet lag have a greater risk for health issues. Night shift employees have been linked to higher rates of heart attacks, diabetes, disrupted menstrual cycles, high blood pressure and cancer. Now a new study says these evening jobs are also responsible for disrupting our genetic makeup. 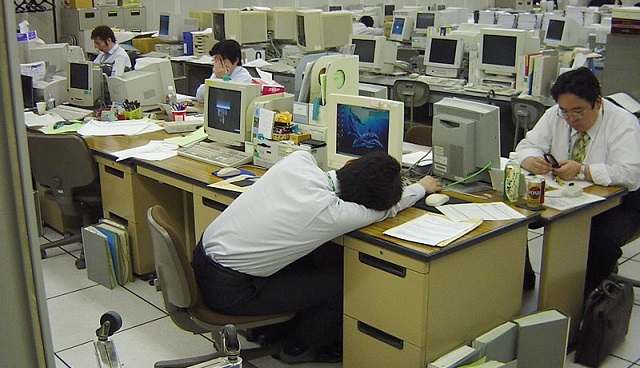 3 Responses to "Overnight Workers Have Much Greater Health Risks Study Says"